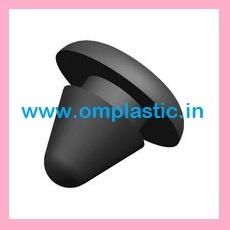 RUBBER GROMMET, BUSH LOCATOR FOR HORN ASSY. (20021225) ~ OM PLASTIC INDUSTRIES PVT. LTD.
OM PLASTIC INDUSTRIES PVT. LTD. The Solution Hub For Plastic Plugs, Caps, Feet, Rivets, Clips, Screws, Nuts, Washers, Grommets, Bushes, Cable Ties, Knobs, Handles, Kits, Packaging, Rubber Band, O-Ring, Gasket, PU Cord, Seal, Flat Washers, Cup Washers, Spacers, W/S Filter. We are one of the noteworthy enterprises engaged in offering superior quality Various Rubber Grommets. These grommets are manufactured using polymers such as nitrile, EPDM, SBR, Silicone and Viton. These grommets are used to mechanically protect sharp edges of drilled or punched holes. Further, these grommets are mostly manufactured according to the specifications provided by the clients. Also, at our manufacturing unit, our engineers have designed the grommets adhering to international industry standards.These products are extremely rigid in state and offer high level of performance. Optimum strength and longer functional life are considered as some of the salient specifications of our clients. Quantity: 500 & 1000 Nos. "Motto of Om Plastic Industries is to strive hard to attain customer satisfaction by ensuring timely delivery of world class products at very reasonable prices."